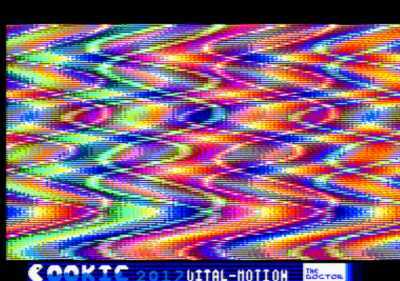 This prod is an Amstrad CPC is demo from the Doctor ^ Vital-Motion! and obtain the second place in the Cookie Demoparty at les Jardins d'Alice in Montreuil Town near Paris. Nice try for a first demo, doctor ! Thumb up for motivation: I want more stuff on CPC - I don't want CPC to release some high-level and/or massive demos only - there's place for everyone. Note 1: still happy about a comeback - whatever nickname/group you wish to use. Note 2: next time ask (me) for help to get 312 scanlines/50Hz and CRTC compatibility. Great and tune cover is sweet! A lot of good old productions on almost all platforms suffer this. Plissken: Hope to see you making better than that. Piggy for motivation: it's ok but you can make better. A bit too classical to my taste, let's hope for a more ambitious release next time! Nice music by the way. Huum a pseudo of a pseudo !! ;-), plissken thumb up . Cool prod even if a little short . page created in 0.017210 seconds with 15 queries.